Planning staff organized an interagency workgroup to create a much-needed, interactive source of information on the topic, Planning’s Forest Planning Resource webpage, which is now available online at https://planning.maryland.gov/Pages/OurWork/envr-planning/forest/ forest-resources.aspx. Together with representatives from the Sustainable Forestry Council and other DNR Forestry staff, Planning staff members Debbie Herr Cornwell, Dan Rosen, and Jason Dubow worked to identify which materials to include. Planning’s communications group, including John Coleman and David Buck, contributed to the process as well, providing guidance on how to best organize and deliver the most useful information. This collaboration resulted in a rapid and seamless webpage creation process. 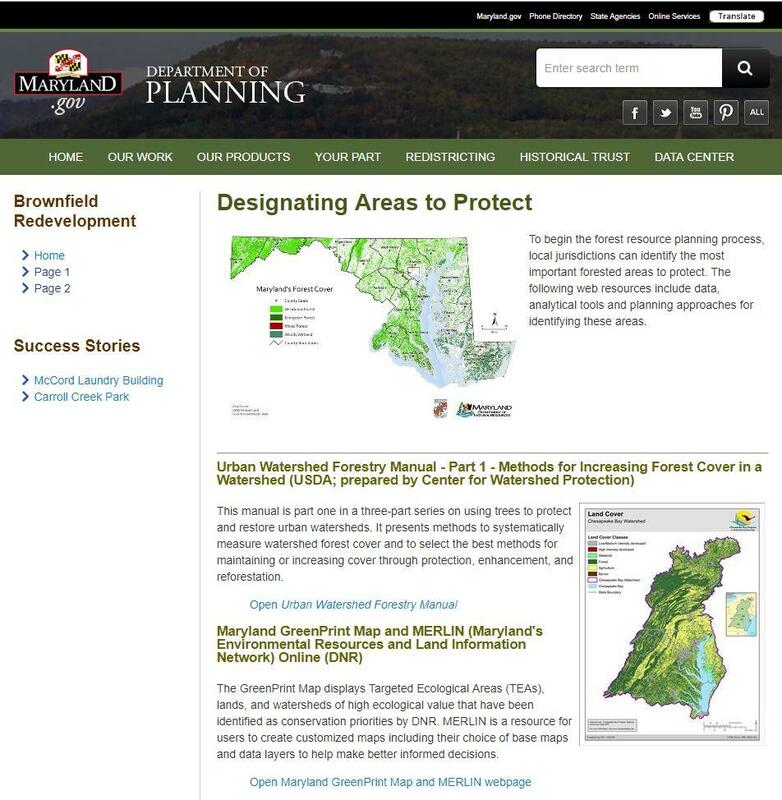 Included in this step are Maryland’s GreenPrint Map which displays targeted ecological areas, including watersheds of high ecological value; DNR’s Strategic Forest Lands Assessment, which identifies forest lands with ecological, social and economic benefits; and i-Tree Tools, which assess and manage forests. Tax incentives, zoning, transferable development rights and purchase of development rights are addressed in this section. It also includes case studies, such as those seen in the Chesapeake Bay Trust Conservation Land-Use Policy Toolkit, many of which demonstrate the excellent work of jurisdictions within the Bay watershed. Preserve Trees During the Development Process – how to provide physical protection during construction activities:This section describes conservation subdivision approaches, riparian forest setbacks, technical guidance for successful onsite tree protection measures, and online resources including the Maryland Forest Conservation Act, a Guide to Preserving Trees in Development Projects (PA University), Reduced Parking Footprint Criteria (LEED) and ANSI A300 standards for tree care practices. The Forest Planning Resource webpage is available at the link above and is receiving positive feedback. The next time you return from a visit to your closest forest, or even when you get back from a faraway trip to a park you may never see again, check out Planning’s Forest Planning Resource webpage and learn how you can become an active participant in the preservation of some of Maryland’s most important living creatures. But please don’t visit the page when you are in the woods. In that moment, screens just get in the way.